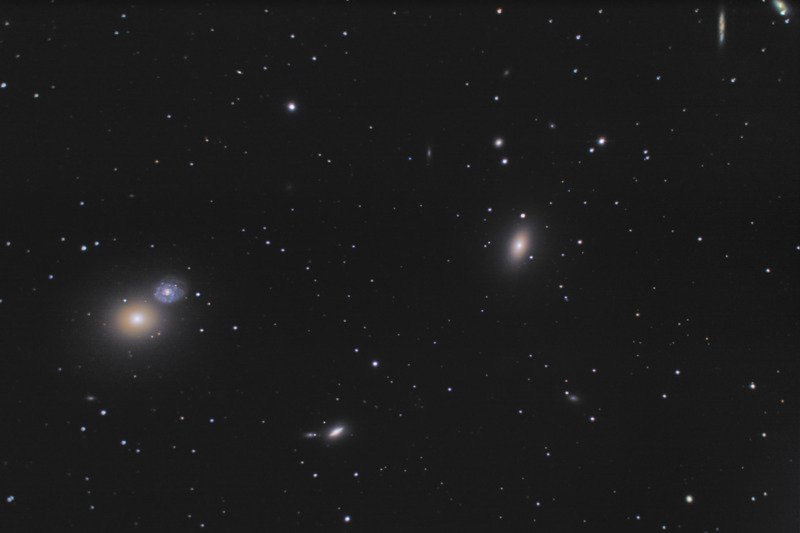 M60 is the dominant elliptical galaxy on the left in this image, and M59 is the large elliptical galaxy on the right. This image shows numerous other galaxies including NGC 4647 (spiral galaxy next to M60), NGC 4638 (larger galaxy near bottom center), as well as NGC 4606 and 4607 at upper right. Looking at the enlarged image, I was able to count over 20 galaxies in this photo! These galaxies are all part of a huge galactic cluster called the Virgo cluster, which contains over 2,000 galaxies. Software Used Images Plus 4.0 for camera control, calibration, stacking, digital development. Images Plus 4.5 for deconvolution, multiresolution sharpening, smoothing and noise reduction. Photoshop CS5 used for levels and curves, color balance, high pass filter, star shrinking, saturation adjustments, vibrance, and selective color. Gradient Xterminator for gradient removal. Carboni Tools for additional saturation adjustments, noise reduction, and smoothing. Notes This is first photo I've taken since correcting the problem with fog on my secondary mirror as well as fixing my poor collimation. This photo shows much better stars and sharpness than I had before, and it makes me all the more excited to have rekindled my astrophotography hobby.